Companies determine what kind of investors they want to attract and the investment opportunities they face before setting the target payout ratio. The ratio is calculated by dividing Dividends Paid by Net Income for the same accounting period, or Dividend per Share by Earnings per Share. A high dividend ratio appeals to investors who want high current income and are unconcerned with capital gains. A lower ratio appeals to investors who value growth and capital gains over income. In general, the Dividend Payout Ratio of publicly traded companies has steadily declined, on average, since 1940.
capital gains: Profit that results from a disposition of a capital asset, such as stock, bond, or real estate due to arbitrage. The Target Payout Ratio, or Dividend Payout Ratio, is the fraction of net income a firm pays to its stockholders in dividends. It is calculated by dividing the dividends distributed by the net income for the same period. The part of the earnings not paid to investors in the form of a dividend is left for investment to provide for future earnings growth. Investors seeking high current income and limited capital growth prefer companies with high Dividend Payout Ratios. However investors seeking capital growth may prefer lower payout ratios. This is appealing to some investors because a lower dividend implies that more earnings are being reinvested in the company, which should cause the stock price to rise. Some investors, such as young people saving for retirement, may prefer higher returns later than smaller cash distributions now. The Target Payout Ratio depends on what investors the management of a company are trying to attract, and what current investors’ expectations are. It also depends on the growth goals of the company. If a company is trying to grow very fast, it may prefer to reinvest its income in expanding operations. A more established firm with an established market probably does not need to expand its operations, and would prefer to use its earning to compensate its investors. High growth firms in early life generally have low or zero payout ratios. As they mature, they tend to return more of the earnings back to investors. The Residual Dividend Model first uses earnings to finance new projects, then distributes the remainder as dividends. The Residual Dividend Model implies the Irrelevance of Dividends Theory, which claims that investors are indifferent between returns in the form of dividends or capital gains. Residual Dividends result in a passively-calculated dividend, which changes every year. Since the Residual Dividend Model assumes dividends and capital gains are two forms of the same value, it will not affect the market value. dividend: A pro rata payment of money by a company to its shareholders, usually made periodically (e.g., quarterly or annually). The Residual Dividend Model is a method a company uses to determine the dividend it will pay to its shareholders. Companies which use retained earnings to finance new projects use this method. The company first determines which new projects it wants to finance, dedicates funds to those projects, and then distributes any leftover profits to its shareholders as dividends. This model can lead to unpredictable and inconsistent dividend returns for the investor. However, the company’s goal is to generate further profits from the projects it funds, which benefits the shareholders overall. What investors want are high returns – either in the form of dividends or in the form of re-investment of retained earnings by the firm. Writing a check. : Companies usually issue investors a check for their dividend. The Residual Model dividend policy is a passive one and, in theory, does not influence market price because the same wealth is created for the investor regardless of the dividend. The firm paying out dividends is obviously generating income for an investor; however, even if the firm diverts some earnings for investment opportunities, the income of the investors will rise later, assuming that those investments are profitable. The dividend, therefore, fluctuates every year because of different investment opportunities and earning levels. Dividends, which are distributed based on how many shares each person owns, can be paid using cash, stock, or other company property. The most common method of payment for dividends is cash. This can be either electronic transfer or check to the shareholder, and is taxed when it is received. The dividend can also be paid as new shares of stock. This can either involve newly issued shares or old shares. The most rare method is to distribute property or other assets as the dividend. interim: A transitional or temporary period between other events. proportion: A quantity of something that is part of the whole amount or number. A dividend is allocated as a fixed amount per share. Therefore, a shareholder receives a dividend in proportion to their shareholding. 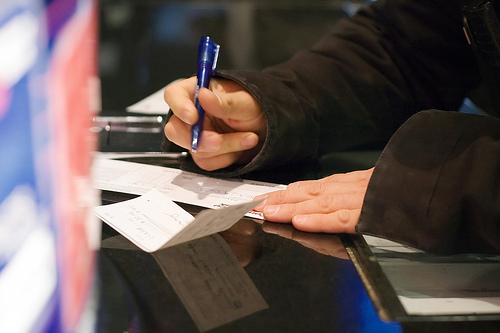 Cash dividends are those paid out in currency, usually via electronic funds transfer or a printed paper check. Such dividends are a form of investment income and are usually taxable to the recipient in the year they are paid. This is the most common method of sharing corporate profits with the shareholders of the company. For each share owned, a declared amount of money is distributed. Thus, if a person owns 100 shares and the cash dividend is 50 cents per share, the holder of the stock will be paid 50 dollars. Dividends paid are not classified as an expense, but rather a deduction of retained earnings. Dividends paid does not show up on a Income Statement but does appear on the Balance Sheet. 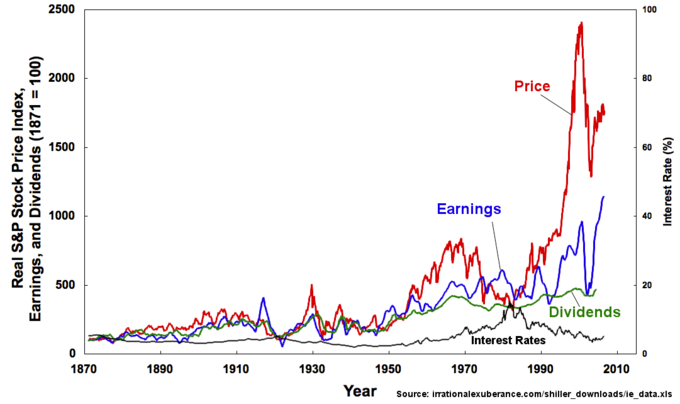 Real S&P Prices, Earnings, and Dividends 1871-2006: A graph visualizing S&P’s prices, earnings, and dividends over a 130-year period. Earnings and dividends have risen steadily over time; price spiked substantially around 2000 and is only slightly lower now. Stock or scrip dividends are those paid out in the form of additional stock shares of the issuing corporation or another corporation, such as its subsidiary corporation. They are usually issued in proportion to shares owned. For example, for every 100 shares of stock owned, a 5% stock dividend will yield 5 extra shares. If the payment involves the issue of new shares, it is similar to a stock split: it increases the total number of shares while lowering the price of each share without changing the market capitalization, or total value, of the shares held. Property dividends or dividends in specie (Latin for “in kind”) are those paid out in the form of assets from the issuing corporation or another corporation, such as a subsidiary corporation. They are relatively rare and most frequently are securities of other companies owned by the issuer. However, they can take other forms, such as products and services. Interim dividends are dividend payments made before a company’s annual general meeting and final financial statements. This declared dividend usually accompanies the company’s interim financial statements. Other dividends can be used in structured finance. Financial assets with a known market value can be distributed as dividends; warrants are sometimes distributed in this way. For large companies with subsidiaries, dividends can take the form of shares in a subsidiary company. A common technique for “spinning off” a company from its parent is to distribute shares in the new company to the old company’s shareholders. The new shares can then be traded independently.